After several days of introspection, I am ready to reflect on the happenings of Saturday August 22nd. This wedding cake was for my dear friend Nadia and her husband, Peter, a lovely couple with a preference for buttercream and a dislike of pretense. Although honoured to be trusted to create their wedding cake, I knew that, as a self-confessed perfectionist, completing the task to my standards would be only the first challenge; surviving the evening as a guest while witnessing people's reaction to the cake would be the second. Buttercream is not as forgiving as fondant and despite my obsessive myopic focus on the imperfections, the four-tiered white and butter yellow centrepiece was, overall, pretty darn good. 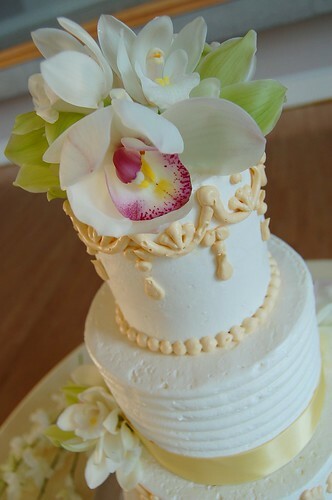 Adding fresh orchids to anything will make it look ten times better! Nadia and Peter had chosen the bright citrus flavours of lemon curd and mousseline, and mandarin orange, combined with vanilla cake and almond dacquoise. 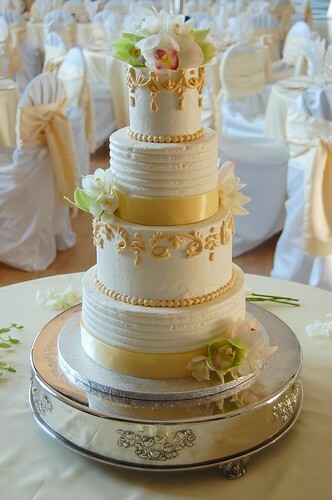 The actual wedding cake would produce 70 servings and the remaining 100 pieces were from a slab version. Thankfully, my boss let me do everything at work on my own time, alleviating any space restriction concerns which I had with Patricia's wedding cake. As the evening progressed, I grew increasingly agitated watching the top tier of the cake (the only one without dowels) slowly bulge. 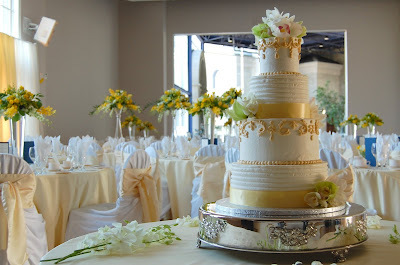 By the time the caterers finally took away the cake, it had sat unrefrigerated for almost six hours, and was virtually unrecognizable as cake when served. In contrast, the pre-cut slab pieces were ice cold, served straight from the refrigerator. I think that I suffered a minor cardiac event when someone asked me, "Is it supposed to be frozen? ", and temporary aphasia when everyone kept repeating "But it tastes great!" after trying either the brick hard or soft mush version of wedding cake. It is easy to blame the caterers in this situation but should I have done something to prevent this? Should I have checked how cold their refrigerator was? Should I have taken the wedding cake back to the kitchen myself hours earlier? I had wanted to simply be a guest, not a pseudo-caterer, at my friend's wedding and had mindfully chosen to restrain the control-freak in me. But this decision to not micro-manage the wedding cake resulted in what I perceive to be my failure as much as the caterer's. And so, after several days of self-pity, I conclude that this has been a good learning experience, reinforcing my belief that being an unapologetic micro-manager is a good thing, and to try to never attend any event where my cakes are served! PS. Congratulations Nadia & Peter...I'm happy if you're happy! Posted by Charmaine at 2:04 p.m. It looks beautiful! You should be very proud. I can totally sympathize with you. After putting in so many painstaking hours I always feel anxiety letting someone else move or cut the cake! Especially when it's fondant, most people mangle fondant cakes when they cut them. I just did a fondant cake in this August heat and humidity and I stressed hard about the cake sitting out. I called my friend and asked her a dozen questions about how it went, did it cut properly, did it smoosh out when they cut it, did it taste good!!! Your cake flavor sounds amazing, I'd love to try that. I'm sure they loved it and it really is a beautiful cake, best wishes in all your endeavors! August 27, 2009 at 4:39 a.m. Absolutely gorgeous. EEessh... catering is SO difficult. Some of those issues (heat vs freezing) have little answers. All you can do is cross your fingers and hope for the best. Your cake is beautiful and I'm sure it was delicious! August 27, 2009 at 12:25 p.m. I second that: It does look beautiful! I'm sure your friends and all the guests were amazed! I for one, LOVE frozen cake! August 27, 2009 at 1:23 p.m.
Just wanted to let you know that I followed your blog from CC and really enjoyed reading it. You are very talented with cake decorating as well as writing. I also noticed that you must have an exceptional camera. Your pictures are outstanding. August 27, 2009 at 2:46 p.m.
December 26, 2009 at 7:58 a.m.